Low temperature records overwhelm highs in the USA this past week – where's the media to tell us how this should be viewed? | Watts Up With That? Low temperature records overwhelm highs in the USA this past week – where's the media to tell us how this should be viewed? If this had been summer, and the numbers reversed, you’d see Seth Borenstein writing articles for AP telling us this is ‘what global warming cooling looks like’. Maybe Bill McKibben will chime in about “melted frozen street lamps“. I had to wear winter jacket this morning in central Texas to take my dog out for a walk this morning. I was surprised to see that my old town nearby Dallas hitting in the mid 30s this morning! The stupidity of Peter Gorrie on full display. Prentice is apparently an Investigator buff, and reviewed a book about its unsuccessful voyage last winter. Had the ocean remained frozen, the ship would continue to rest unseen, 11 metres below the surface. Climate change will unseal many other Arctic treasures over the next few years. Most important — less romantic but incomparably more lucrative than an old boat — are oil and gas deposits. I emailed Peter asking how “an old boat” got to where it did before “global warming”. The media simply follow the talking points given to them. When temperatures are low, it is weather that can safely be ignored. When temperatures are high, it is climate and time to shout gloom and doom from the headlines. Lot of hot air on the left coasts! Well your learning and your marks are getting better. 1. Correct. Climate models predict short term variability that is larger than the long term trend. 2. Correct. 1 week of temperature extremes proves neither long term cooling or warming. 3. Correct. Regional trends are only weakly affected by global trends. 4. Wrong. Polar bears is a future prediction not a current situation. 4. Correct . Greenland is melting. 4. Wrong. Look over there are the drought in the USA and hope its going to end soon. Warmer summers and colder winters is a world-wide pattern that started around 2000 and appears to be strengthening. As I have just commented in the Bob Tisdale thread, it shows up in the SSTs and troposphere temperatures, and arguably the Arctic and Antarctic sea ice summer versus winter extents, and NH winter versus spring snowfall as well. Historical records show a similar pattern in the Little Ice Age. David, how about you do some actual research re. polar bear populations, particularly in the Canadian North. They sure as hell aren’t in decline. In southeastern Washington State, elevation 800 ft., I planted 100 tomatoe plants in May. I only harvested 3 dozen ripe tomatoes before the frost hit last week. Only the early ripening varieties made it to fruition before the frost struck. Remember kids – EVERYTHING is predicted by global warming! Too hot? Global warming! Too cold? Global warming! No change? Global warming! See? That wasn’t so hard. Now – PAY your global warming tax so the hard working NASA GISS scientists can get their double digit salary increases! And stop yapping about $6/gallon gas – and skyrocketing energy prices. Join the global warming mania! Save the polar bear cubs! 350ppm CO2 or bust!! Baby its getting cold outside!! OH YEAH!! Welcome relief for me. After enduring weeks of 100+ temperatures, today I finally turned on some heat. Tomorrow it will have to stay on but by next week, the air conditioning will have to be on during the day here. Not unusual for North Carolina. The day I was born, there was a light snow. 3 days later it was unusually warm with a high almost at 70. A few days later it snowed again. This was in 1978. The cold rarely stays entrenched here. @noaaprogrammer Over here in southwestern Washington State we had our first frost about two weeks ago. Earliest I remember in 20 years. This last week has been frozen every day in the morning. Saturday it was 31 F at 0830, by 1130 it was 65, hit 77 about 1530, and by 1800 it was 48. Been like that for a while. It’s been the coldest and driest October I ever remember. I was in grade school in the 70’s, so I remember the “Coming Ice Age” and the local weather subjectively seems to be trending back. My wife is a few years senior to me, and she says the same thing. It’s great having the Lazy Teen with us to demonstrate Warmist thought processes and techniques like…. 1. Never ever ever answer the actual question asked, or address the original issue. Come on then Lazy, you seem to be so erudite about so much…where IS that media coverage? The MSM is telling us how this should be viewed. The are telling us it should be ignored. They are wrong but that’s a different discussion. I posted at Grist the other day, but upon returning it had disappeared. I’m just waiting for some adventurous reporter to come up with a provocative article entitled, “Global Warming Causing Global Cooling”…. This website (below) is really useful for seeing how record lows and highs stack up. The site allows you to search for specific dates and states. Though we absolutely are experiencing a cold snap throughout much of the U.S., the year-to-date totals show that highs are outpacing lows by a considerable margin. I was waiting for someone to say, all extreme or abnormal events are caused by man made global climate change. No matter what happens, it’s caused by man and we must stop it or it will get really hot or really cold. According to a new study published in Proceedings of the National Academy of Sciences, however, this seeming inconsistency is not just unsurprising: it was inevitable. By focusing on the two degree goal, negotiators inadvertently guaranteed their efforts would fail, because there’s no hard evidence that any specific temperature target marks a dangerous threshold, with clear consequences for crossing it (instead, there is plenty of evidence that more and faster warming entails greater risks of major consequences, such as the collapse of the polar ice sheets). This uncertainty, the study argues, provides an incentive for countries to be free-loaders, jumping on board with the agreement without making potentially costly emissions reductions. The study is based on results from a simulation game played by 400 students, who played the role of negotiators at a climate summit. Scott Barrett, a professor at Columbia University’s Earth Institute and the lead author of the study, said that in practically every simulation, despite having a temperature target to shoot for, the players in the game committed to emissions limits that allowed the amount of planet warming greenhouse gases in the atmosphere to soar to what would almost certainly be “catastrophic” levels. The problem, Barrett said, is that unless uncertainty about the threshold can be reduced to zero, individual countries have an incentive to do less than what would be required to avoid exceeding the threshold. In reality, this uncertainty can never be reduced to zero, Barrett said, because of the inherent scientific unknowns about what causes abrupt and catastrophic climate change. Where was the media at the BEGINNING of the week discussing all those record highs? A quick Google search suggests that local media covered both events as it pertained to the local area, but there was little national coverage of either set of weather extremes. Let’s face it, Anthony, a couple days of warm or cool weather in sparsely populated parts of the country just doesn’t make national news. Now, compare this to last March. In one week, over 3000 record high temperatures were set across the US, and over 7500 record high’s for the month. The article you dramatically link to above discusses 3125 record highs in June. If the record lows in October continue at the same pace for the rest of the month, we STILL would still only set about 1/2 as many record lows as the record highs set in June (and about 1/4 as many as March). So Anthony, to compare this to last summer or spring, THE RECORDS WOULD HAVE TO CONTINUE AT TWICE THIS PACE FOR THE REST OF THE MONTH! Then the numbers would be reversed. If the records do indeed continue at this pace for the rest of the month, at that point I would expect to see the media cover this as national news. As it is, a couple days of record cold is barely local news. No, its not really useful because they use adjusted data. Basically you have to wipe out the thirties heat and believe that all their adjustments are justified… until we can get an untampered with data set or have the scientists who do the tampering explain why and how they tamper, we can’t draw useful conclusions about our temperatures. It’s a shame really, but historical data is often not accurate and unless “skeptics” archive it, we lose a lot of it. Re J Williams. Wow that is one interesting chart. So reading that there have been 6 times more temp max records than temp mins. Obviously there is more of the year to run, but clearly there is a whole lot of catching up to do. I also see the 2011 year to date had three times more high records than low. So the current cold weather in the U.S. isn’t quite as regional as it might look and I’m curious to see if the coming northern hemisphere winter matches what we’ve just had in the south. According to this site: http://www.cdapress.com/columns/cliff_harris/article_a05e3752-947f-5606-a52d-f2ecb906f3b3.html , the total world sea-ice extent a week ago was 18 million square miles, a little under the average. But then, a few months back, before the ice-destroying Arctic storm of August, it was about 1 million square miles above the average. Arctic sea ice is essentially a very ephemeral thing on geological time scales. 3 million years ago, there wasn’t any. It comes and goes very quickly and easily. 7000 years ago, evidence shows the coast of Greenland was ice-free, at least during the summer. Given that it has expanded and contracted substantially for millenia, without significant ill effects, I don’t think the extent of Arctic sea ice matters very much to the environmental health of our planet. And its coming and going has no effect on sea level anyway – nor apparently does it endanger polar bears, who would have died out long ago if they were that sensitive to ice extent. But of course, you’ll never hear much from the MSM about any of this because it just doesn’t sound like the rising level of CO2 is causing the kind of warming they’ve been promising us, does it? It’s time for you to learn that the media are corrupt not stupid. Stop watching the TV. Free your mind. If polar bears happen to be thriving, it’s certainly worse than we thought, for the huge carnivorous animals threaten to devour our grandchildren. And that’s the point. Phillip, the Pacific NW has not had warmer summers. It really does not matter what your pleasure is, potential end extreme, half-precessional cycle old eccentricity minimum interglacial, or extended (a la MIS-11) interglacial, the rapid climate shifts at such moments we know something of via what we can technologically glean from the Antarctic and global sediment data (3 thermal peaks, with lots of climate noise at end MIS-19). Or just one long one at the end of MIS-11 (which the latter half of which we best fit, even though we are only half a precession cycle old, and MIS-11 might have been 2 such) full cycles, or the pair of thermal anomalies at the end of MIS-5e……. There could, podsibly, irreversibly, inevitably be an orbital tipping point ahead. On http://wattsupwiththat.com/2012/10/08/a-paper-unifying-cosmic-ray-interaction-cfcs-ozone-and-warming/#comments comes to mind. I think George may have something here. Half-polar albedo. That could just be the missing element. As George points out, Antarctic ice is mostly continental, perhaps way too thick to melt, even in a 2-precessional cycle old recent extreme eccentricity-minimum interglacial. It could be that George has identified the missing tipping point. Presence or lack of one of the two polar albedo-es….. I, for one, would welcome such an informed discussion. Comments on the possibly inevitable end-Holocene, vis-a-vis 2012 Arctic sea ice met????? I can’t put my finger on it but I’m convinced that comparing record highs with record lows is wrong. Somehow I don’t think they happen in unison. Maybe someone with more knowledge in these matters can shed some light on it? It’s straight out of Fawlty Towers “don’t mention the war” with the added “I think I got away with it”.Consummate comedians like Cleese use their talent for humour. Actors like McKibben, Jones and Hansen for ill will, chaos and selfish self-promotion, while chasing the almighty dollar and self glorification. Maybe one day we will look back and wonder if any of those people ever had any regrets behaving in the fashion they do now. It certainly is an eye opener to witness just how far same people will go to promote obvious misinformation and denial of fact. And if it were a month of record colds, the media would still spin it into global warming gold. Such specious alchemy was the point of this article I think. Someone brought up how hot this March was this year, so I figured I would throw in this odd fact: The month of April was colder then March for a good portion of the midwest and elsewhere…. which is fairly unprecedented. Where was the news about the record cold April after the record warm March? Non-existant? Yep. We don’t see cold, we only see warm. I guess that is post-normal science…ignore all evidence that says you are wrong and just jump up and down with glee about the end of the world and how someone somewhere predicted it with a computer model. Yup, that is science nowadays folks. Of course, this will just be discounted and explained away as an indication of the ‘new’ climate extremes – all as a result of Global warming……. Since there has been no “global warming” for the past 10 – 15 years something has suddenly become obvious to me, and I now propose this new hypthesis. Increasing Carbon Dioxide in the atmosphere causes “Global Cooling”! From observation this conclusion is just as valid as the current hypthesis. And governments can keep on taxing us in the same way only this time it is to prevent cooler world temperatures. The “warmists” can now be known as “coolists”! Now where do I apply to get my millions of grants and funding to continue my research? No, the problem is that the records are *not* adjusted for urbanization effects and poor station siting. There will always be more high records, especially high mins due to urbanization. There may be more record highs due to poor siting although that is not as clear. While the average temperature calculations (e.g. GISS) use adjustments to remove urbanization effects (IMO poorly because they smear badly sited station data into mainly good stations) the records that are listed contain all the stations, no matter how well or poorly sited. It has been suggested by some that many older surface station records were discontinued with the aim of ‘cooling the past’. Is it possible that cold records being set now have been surpassed in the discontinued histories? So your point was what, exactly? And for the record: All these “OMG IT IS WARM TODAY, WE ARE ALL GOING TO DIE DUE TO CO2!! !” reports have firmly put me in the skeptic camp by now. I find these kinds of alarmist reporting to be insulting to my intelligence and disgustingly stupid. It’s odd that central NC shows as a “high min temperature” record, given that the temperature outside right now is 47F and the high temperature yesterday was in the low 50s. We’ve had this pattern for three days — bitterly cold and drizzly, especially for this time of year. Neither of these are particularly close to a record — the record high for Chapel Hill Airport (8 or so miles away) is 94F set in 2007, the low is 33F set in 2000, but the 52F high temperature equals the normal low temperature for this time of year. We did have a stretch early in the week where it was warm and wet and the temperature stayed a uniform 72F or thereabouts for 48 hours — perhaps that set a cool-side warm record, but given that the normal max temperature is 75F it wasn’t really all that anomalously warm. Still, RDU has announced that yesterday set a minimum maximum temperature record (and so far, seems likely to do so today as well) at 49F, well under the previous min/max record of 53 set in 2000. Personally, I wish we could once and for all eliminate the “daily max/min” method of determining “weather extremes” and go for “true time average of temperature”. Surely we have the instrumentation and data now to avoid a methodology that dates back to when humans would go check a physical thermometer a handful of times a day or a thermometer arm would push a physical marker to its maximum and minimum extent. I am quite certain that the max/min/median temperatures for a day are none of them particularly well related to the true mean temperature obtained from a 24 hour midnight to midnight time average at a location. Furthermore, I’m quite certain that high temperatures are a lot more likely to be spike events of relatively brief duration compared to low temperatures, that tend to be systematic and persistent near dawn except when they are associated with the passage of a front. Still, many of those yellow dots on the complete map are also or currently blue; perhaps it just took the front longer to get here, perhaps a record warm min trumps a record low max, but there is nothing all that crazy about both occurring in a week as they did here. The rest of the week is forecast to be seasonal normal highs and slightly colder than normal lows. However, as I’ve noted before, the forecast here is horribly biased on the warm side — we had two days earlier in the week where the high temperature was forecast to be mid 70s to high 80s where the actual high temperature was in the mid 50s. I still wonder about these not infrequent events and the bias they produce in the minds of people who do not actually follow the weather but rather trust the forecast as if it is the reality. Today the high temperature is forecast to be 59F — if we have some sun, I might believe this, but if our socked in conditions and drizzle persist, we will have a hard time lifting out of the 40’s. Ocean temperatures currently show a lot of warmth in the northern north hemisphere, while in the southern ocean and southern latitudes general cool deepens slightly. Thus in the same year we have record melt in the Arctic (media circus) and record Antarctic ice extent (media silence). It is interesting to speculate if this could be the start of a bi-polar see-saw. This possibility would be strengthened if it were to reverse in future years to a warming Antarctic and sharply cooling Arctic. They can, and clearly do. The high & low map makes it pretty obvious where the jet stream must be, and that’s making big swings north & south. That’s allows both incursions of northern air to the south and vice versa. It’s called meridional flow (kinda parallel to the meridians of longitude) or amplified flow. I tend to look at this high/low map as more curiosity than gospel. A lot of the stations tracked have short records and probably have siting issues. They’re better than Roy Spencer’s famous “For amusement purposes only” ploynomial curve fit to his UAH data though. Record highs are indeed outpacing record lows. 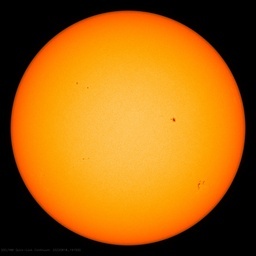 This “proves” global warming only in a trivial sense which lends support to neither the AGW camp nor the skeptic camp. The fact that warming has occurred in the last 40 years is not contested by reasoning climate skeptics. I’m sure I speak for most here when I say that the skeptical argument is that the recent warming is the crest of a wave of natural climate oscillation, related to oceanic multi-decadal cycles, and not attributable – on the basis of current evidence – to CO2. It is an endlessly recurring STRAW MAN argument to assert that skeptics deny any recent warming, and thus that any evidence of recent warming refutes the skeptic position. It does not. The skeptical position is not a denial of recent warming or denial of anything – just a question of “attribution”. A large proportion of recent publications on climate change take the form of: here is evidence for warming in the last 3-5 decades, THEREFORE CO2 is warming the planet. This is an empty fallacy. The skeptical “model” or null hypothesis is naturally oscillating global temperature. In this case, when you are near the peak of the wave, of course natural fluctuation year-to-year in weather will cause more record highs than record lows. Vice versa at the troughs of oscillation. So in fact, as we are at or near a peak of temperature oscillation, record lows are all the more remarkable. Surprisingly, with the timing, wind & rain, this first cool spell didn’t cause a frost here in a frost hollow — only got down to 34F. The bulk of the southward cold “push” was to the west of the central Appalachians. Meanwhile Barrow Alaska set a record high of 40 degrees Fahrenheit on October 5th, and tied the record high of 39 degrees Fahrenheit on October 6th. 40 F might not seem like much but at 71 degrees latitude north, that’s almost tropical for October. Looks like the cold air that should have been over Northern Alaska took a trip south and nothing more. If a few days of record lows (compared to months of record highs) are your best argument against global warming then congratulations to you, champ! Imperial valley is still cooking though. Not that they notice much. They are use to it. My bad…. Forget to add /SARC!!! to my posting. If a few days of record lows (compared to months of record highs) are your best argument against global warming then congratulations to you, champ! Dang – people see what they want to see, huh? Nowhere in the article did I read anything about a few days of record lows being a argument against man-made global warming; it was about how the press report on climate issues. 2. But to the press it does … and long it was warming. Cooling is just “Climate Change” caused by “Warming”. 4. Maybe the Vikings will be able to come back? 4. When has a drought not ended? Did CAGW cause the Dust Bowl of the ’30’s? Or, like the MWP, did it not happen? 5. Just how did Man and his CO2 cause any this either way? 1) Stop using local and regional data as confirmation when it agrees with their views. 2) Accept local and regional data that does not confirm their views. 3) Honestly, speak only of GLOBAL data. I’m sorry to pour cold water (or should that be warm water?) on your anecdotal evidence, but in my part of the central Highveld of South Africa – about 100 miles west of Johannesbug – the winter was 0.3 degress above average at 10.9 C (51.6 F). There was a very rare, and well publicised snowfall in Johannesburg in August. At the same time, my own weather station recorded its lowest ever maximum temp of 6.5 C (44 F). on 7th August. Two weeks later, we set records for the highest ever August maximum on 4 consecutive days, with the temperature making its way from 30.5 to 31.5 degrees C (87 to 89 F) and the August mean temp of 13.8 (56.9 F) was a full one degree C above average. School was different back then. We were taught that a lot of Ohio was covered by glaciers. And that the northern part was smoothed by them coming down from the north….. They told us it was natural and that global climates would oscillate and continents moved and all kinds of stuff happened before there was a civilization. Obviously they lied !!!! Those b&*^%&^$%$s!!! Since those glaciers are gone, there must have been a really nasty civilization that caused the global warming that receded them. We should sue them for being so environmentally unfriendly and starting the natural oscillation of temperatures across the globe. @Ric Werme – To what extent can this meridonal flow, this big swing in the jet stream, be attributed to more open water, more heat and humidity, in the Arctic? To me, this path from global heating to Arctic heating to continental cooling seems to be the most direct path from an abstract concept to an effect many people in the NH can feel for themselves. Now, compare this to last March. In one week, over 3000 record high temperatures were set across the US, and over 7500 record high’s for the month. Not surprising given the increasing UHIE at the stations. High/Low temperature record streaks happen throughout the year, every year. Ratios of highs v. lows over time would seem a good indicator of trend. The shorter the time line, the less value of indicated trend. 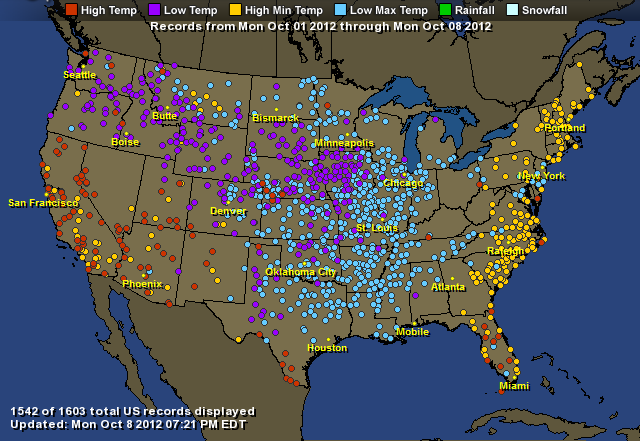 YTD 2012 there’ve been 56,466 record highs recorded and 12,691 record lows. 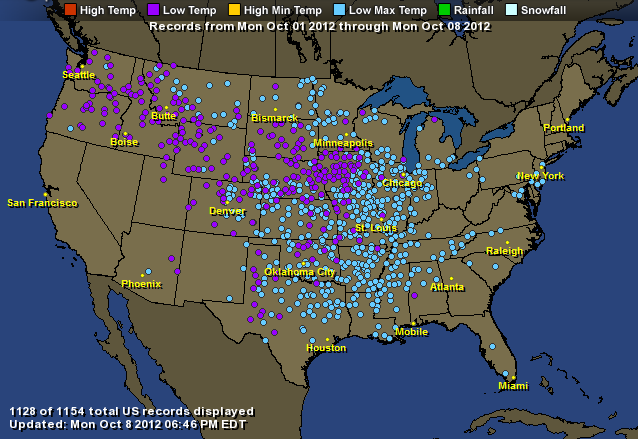 Over the same period in 2011 there were 50,002 highs and 21,952 lows recorded. The question that begs to be asked: What’s the point of this thread? It’s seemingly desperate in character.